Next PSP To Feature Sliding Screen? Oh that's right. More new PSP rumours. We've had a few surface lately, but this latest one is awfully specific, involving the machine's actual design, as well as its insides. 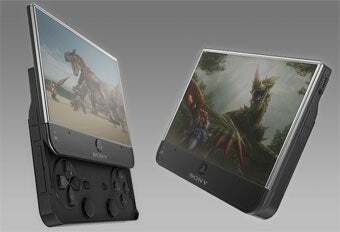 The last rumour came courtesy of IGN, who said the next version of Sony's handheld console would feature "a multi-touch screen, Bluetooth support, integrated GPS and a hard drive". Sony got quite nasty in shooting that one down. It&apos;s time to play whose anonymous, but credible sources are more informed. Today's, however, comes from VG247, who see things a little differently. According to "a highly-trusted source", the next PlayStation Portable won't be an all-new PSP. Its internal architecture will be the same as current models, meaning any and all changes will be cosmetic ones. And those changes involve the addition of a sliding front screen, which is normally employed in mobile phones - including many of Sony's own models - to cut down on size. There's no mention of other features rumoured thus-far, including those involving touch-screen input. As far as rumours go, this certainly seems the most (relatively, of course) plausible to date, because it fits with Sony's long-running company plan of eschewing drastic, radical changes in favour of iterative improvements, which normally take the form (especially when it comes to PlayStation products) of smaller, sexier cases surrounding existing hardware.